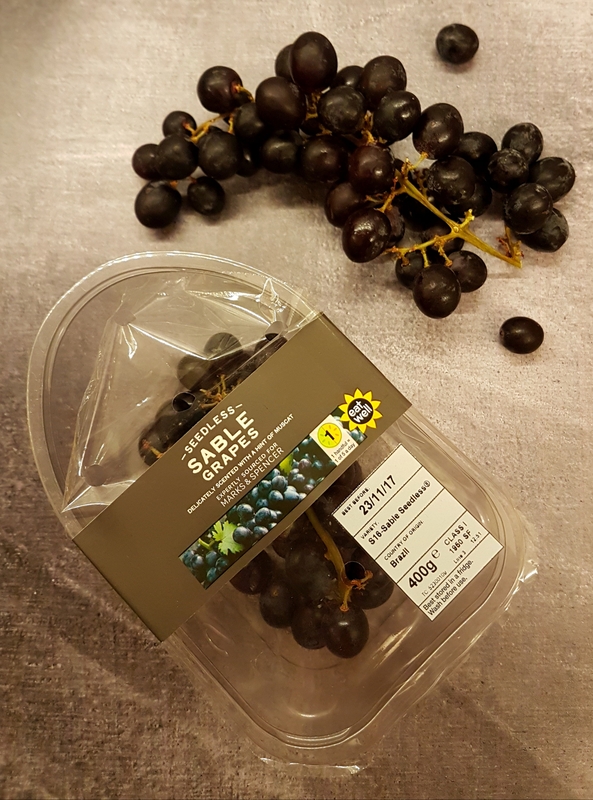 I was recently lucky enough to be sent some delicious punnets of grapes to try from The Grape Artisan, who supplies artisan grapes to Marks and Spencer Food. As well as sending the grapes, they also included a couple of recipes to try (and a bag for when I go and buy more soon hehe). 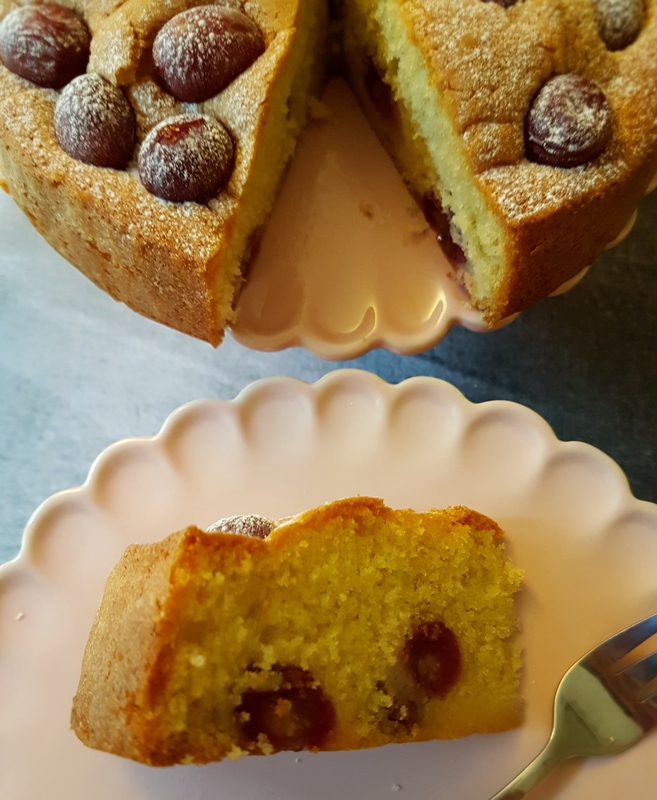 The recipe card for this delicious cake said to use their Sable grapes, but I had already used those in my ROASTED GRAPES RECIPE. I can confirm they are both very sweet and very juicy! If I had to pick a favourite grape from the 4 varieties I was sent, this is marginally the one I would choose. The sweet sweet juice is the nectar of the gods. Back to the recipe. I have to be honest, I was a little bit dubious about how good this would taste. I have seen other recipes in the past for various olive oil cakes, but had always been put off making them because of the oil. Olive oil has such a strong taste, I thought it would overpower any other flavour and be quite unpleasant. I decided to give it a go though, and I’m so glad I did! This recipe produces a beautifully light cake with a delicate lemon and grape taste. You really can’t taste the oil at all! The cake is very easy to make, and is a perfect teatime treat. 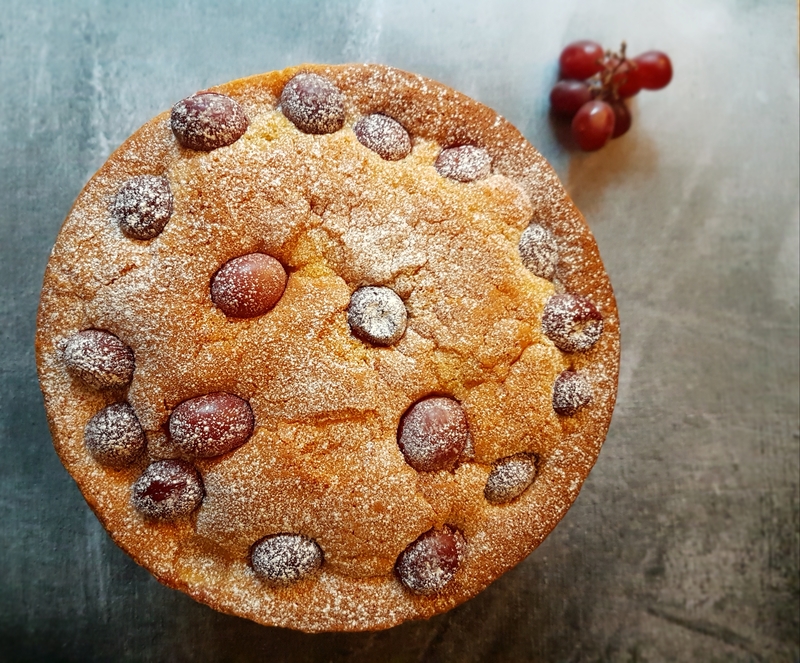 The Grape Artisan has very kindly let me share the recipe with you, so here it is for you to enjoy. A couple of tips from my experience of baking it… don’t worry if it looks like the middle is rising into a dome that looks like it might erupt; it does sink down to a normal level! And if it looks like all your grapes have disappeared to the edge of the cake, add a couple more to the centre for the last 5 minutes of baking. I hope you enjoy this as much as I did. I will definitely make this again and again. Happy baking! Preheat your oven to 200C/180C fan/gas mark 6. Grease and line a deep 20cm cake tin. In a large bowl, beat together the sugar and eggs for 3 minutes, using an electric hand mixer at high speed. The mixture will go pale and increase in volume. Reduce the speed of the mixer to medium, and add the olive oil, milk and lemon zest. Mix well. Turn the mixer to it’s lowest speed setting and add the dry ingredients to the mixture. Do not over mix at this stage. Just mix until all of the ingredients are combined and the mixture is smooth. Pour the mixture into your prepared cake tin, and scatter half of the grapes over the top. Bake in the centre of the oven for 15 minutes. Scatter the rest of the grapes over the cake, and bake for a further 20-25 minutes, until a skewer inserted into the cake comes out clean. Cool on a wire rack, sprinkle with a thin dusting of icing sugar and then serve with a dollop of creme fraiche. 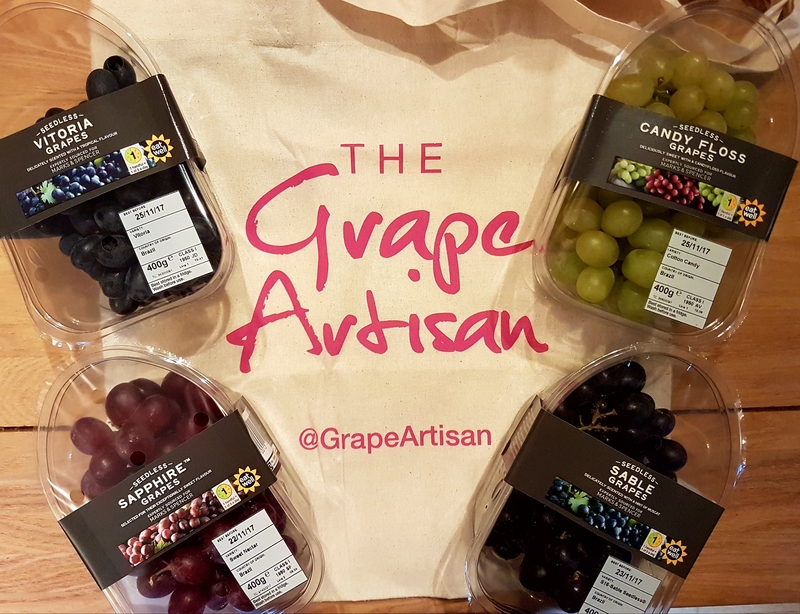 I was recently sent some grapes to sample from The Grape Artisan, who supplies Marks and Spencer Food with the most delicious grapes I have ever tasted, with varieties including Candy Floss grapes. Candy Floss!!! I’ll talk about those beauties in another recipe post. I really had no idea grapes could taste so different! I had previously thought all black grapes tasted the same, all red tasted the same, and all green tasted the same. How wrong was I!? These grapes are just beautiful. They are very sweet, but not quite as sweet as 2 of the other varieties I received. They have a hint of a delicate floral honey flavour which is just sublime. We have recently bought a waffle maker and have been trying lots of different toppings to go on the waffles. I wanted to make a hot, fruity topping which would be nice and juicy. I wondered what grapes would be like if they were roasted, and imagined the juice bursting out making a lovely syrup. I decided to try it and am so glad I did! The result was so good! Roasting grapes really brings out their sweetness and makes them extra juicy. As they get hotter, they plump up and then split a little, causing some juice to escape. 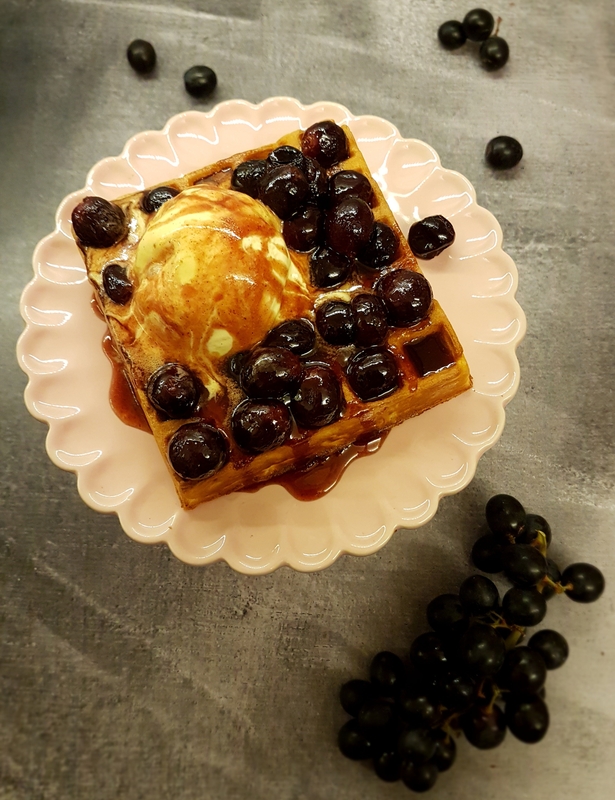 I think it is best to use red or black grapes for this, as the syrup that is made in the process takes on the beautiful colour of the grape. At this time of year (well any time really but especially this time) I love cooking or baking with cinnamon, so I used some in this recipe. It goes so well with the grape flavour! I also added a spoon of honey to help the syrup caramelise slightly. I have to admit this is now my new favourite topping. In fact I could easily eat a bowl of these on their own or with a dollop of cream. They make a wonderful topping for waffles, pancakes, or just ice cream. I even think these would be amazing as the fruity base of a crumble. 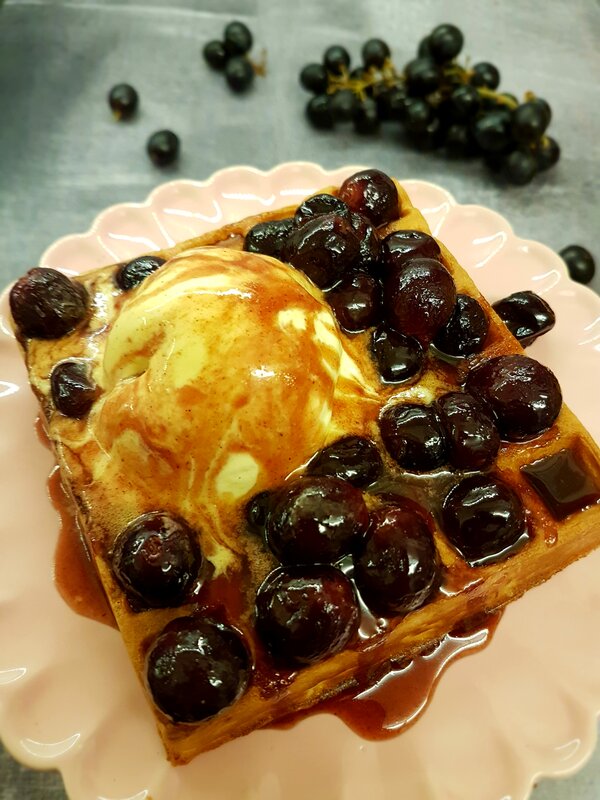 I served mine on a Belgian waffle, with a scoop of vanilla ice cream, and the hot syrup poured over that. You can use any red or black grapes, but I would highly recommend the M&S Sable ones. Delicious! Preheat the oven to 170C fan/190C Conventional. Put the butter into a non-stick roasting pan, and place in the oven until the butter has melted. When the butter has melted, add the honey and cinnamon to the pan. Mix well with a wooden spoon (so that you don’t damage the non-stick surface). Add the grapes to the pan and toss them in the mixture until they are all coated. Place in the centre of the oven and let them roast for 10 minutes. 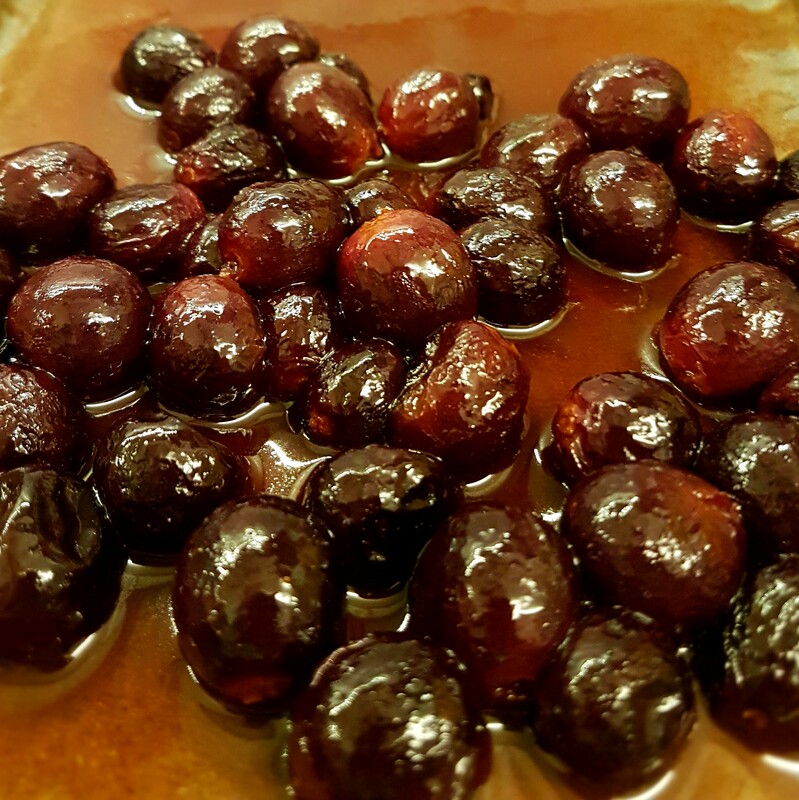 Remove from the oven and gently toss the grapes in the delicious syrup that is now developing. Return them to the oven for a further 5 minutes, or until the grapes have slightly burst and the skin is starting to go a little bit wrinkly. Remove from the oven and serve straight away.